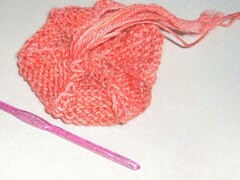 This is a simple little pattern, great for using up odds and ends of yarn - ideal for Fibreholics samples! 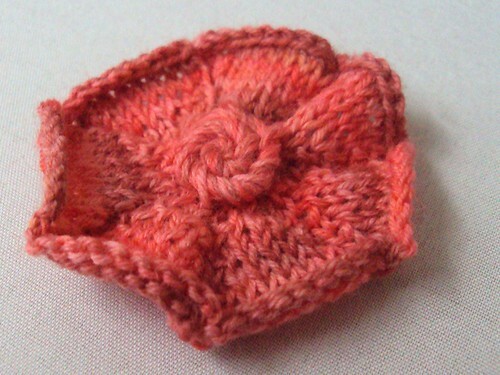 Make at least 6 petals. You could make up to 10 if you want a very full flower. 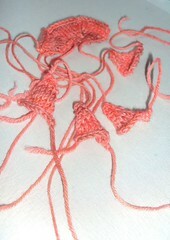 Then you just need to stitch them together. 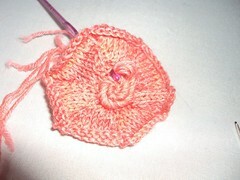 I use the cast-off tail to sew each petal to the next. This leaves all the cast-on and cast-off tails in the middle. 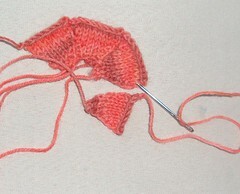 I twist all these tails together and use one of them to stitch them in place in a swirly pattern. 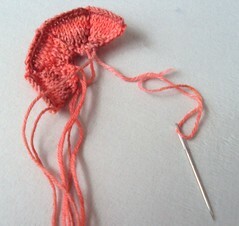 I then use a crochet hook to pull the tails to the back of the flower, tie them off and trim the excess. Et voila! You now have a sweet little flower. You could add a brooch back or sew it on to a bag or cardigan. I Like to sew these onto ribbon to wear in my hair.